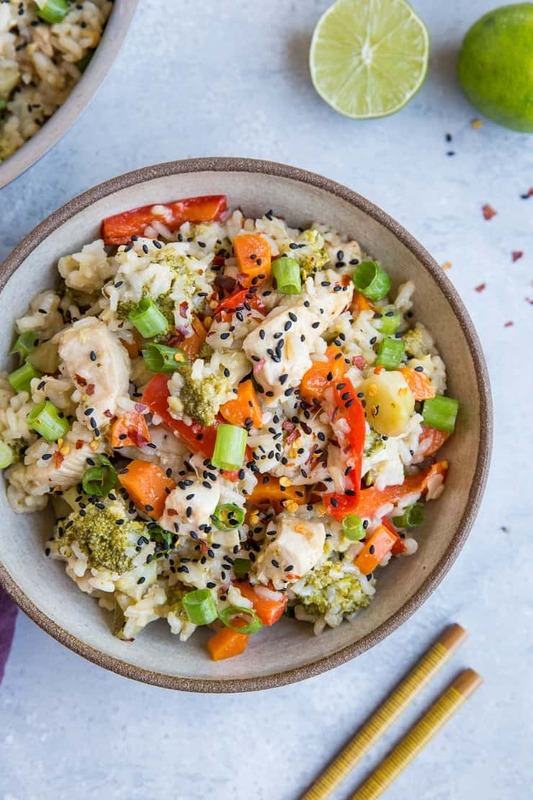 Quick and easy Instant Pot Chicken Teriyaki with rice and vegetables. 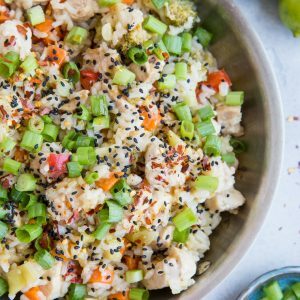 This super simple recipe is packed with flavor and is ultra comforting for those busy times you’re looking for a filling meal. When it comes to trends, I can be quite the slow adapter. It took me years to accept skinny jeans, and I have yet to dive into the world of crop tops and high-waisted shorts. I like to sit back and watch the madness unfold. I witness trends crescendo, reach their peak, then observe as they plateaus or decrescendo. What can I say? I’m a skeptic. WELL, last week, I finally purchased an Instant Pot…my $30 Hamilton Beach crock pot was my first “major” kitchen appliance purchase when I was 23, and I remember the overwhelming feeling of pride after making the investment. Suffice it to say, the thought of any other slow (or in this case, instant) cooker taking precedence over my HB was just too much for my loyal-to-the-death soul to bare. And so, when Instant Pot came out, I hiked up my granny pannies and refused to get with the times. I’m with the times and fully present. I can tell you I am certifiably obsessed with my Instant Pot and completely, utterly dumbfounded by it. Three days ago, I made the most amazing barbacoa beef in it, which took a grand total of 1 hour. ONE HOUR! I kept saying the same phrase over and over: “what normally takes 10 hours in my crock pot took 1 hour in my Instant Pot.” These words…on repeat…like a broken record. This Instant Pot Chicken Teriyaki recipe, which was my maiden voyage with the Instant Pot, took a grand total of 15 minutes in the Instant Pot, and roughly 35 minutes from start-to-finish including sauce prep. This is one of those recipes that turns out tasting so crazy great, requires very minimal effort, and can be made any ol’ day or night. Plus, it is AWESOME if you’re an Instant Pot newbie like me. Your typical teriyaki sauce is loaded with sugar and soy, but this recipe is both refined sugar-free and soy-free. In essence, the sauce is much better for you thank your standard teriyaki. 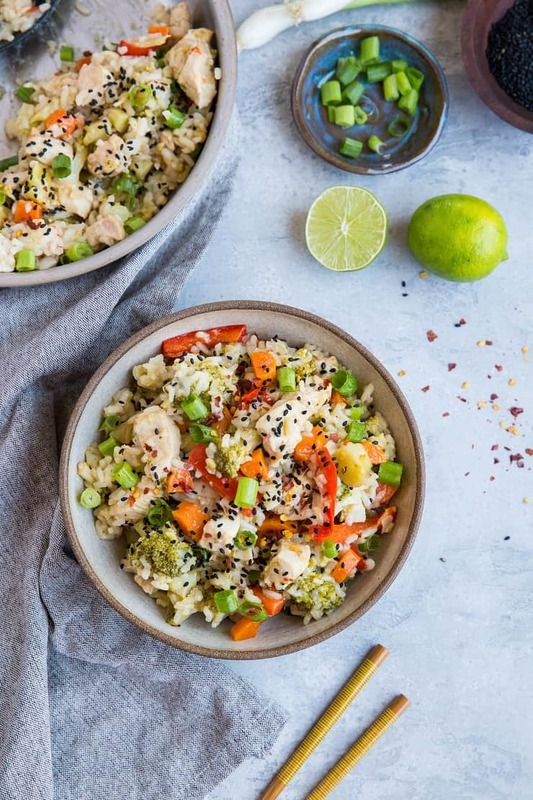 You can go with or without the rice, although I recommend making it with the rice, because it turns out as a complete one-pot meal and the rice helps absorb the moisture of the sauce, creating this ridiculously comforting and flavorful well-balanced meal. Vegetable done-ness..let’s have words. If you prefer your vegetables soft, add them to the instant pot at the same time you add the rice. If you prefer them snappy, you’ll follow the instructions as they’re written in the recipe card and add them after the chicken and rice have finished cooking. You have options, friend. 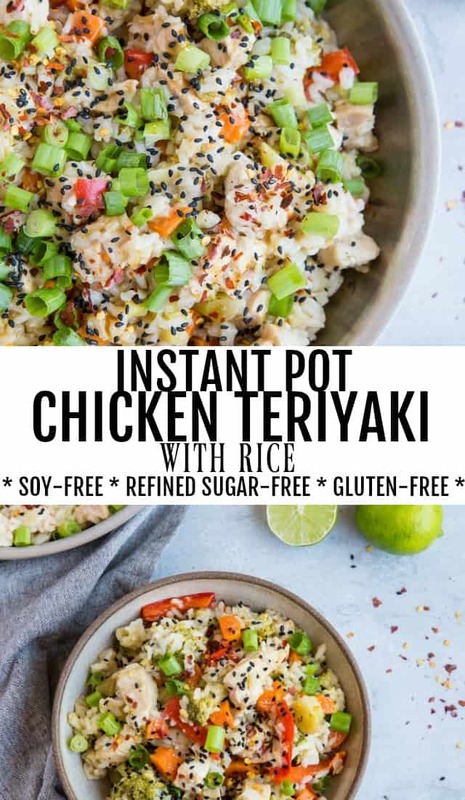 I hope you enjoy this healthier version of Instant Pot Chicken Teriyaki – I already know it will be a staple in my home! Heat all ingredients for the sauce in a small skillet over medium heat and bring to a full but gentle boil. Cook whisking continuously, until sauce is reduced by half its volume, about 3 to 5 minutes. Set aside until ready to use. Turn the Instant Pot on the saute function and allow it to warm up. Add the coconut oil, followed by the chopped chicken, ginger, and garlic. Allow the chicken to brown for 1 to 2 minutes before adding the rice, water, and half of the teriyaki sauce. Secure the lid on the Instant Pot and put it on the Pressure Cook (high) setting for 3 minutes. Once finished on pressure cook, allow the steam to release on its own for 10 minutes, remove the lid of the Instant Pot, and add the vegetables. Put the Instant Pot back on the saute setting and stir everything together. Continue cooking and stirring until vegetables have reached desired done-ness. Stir in the rest of the sauce. 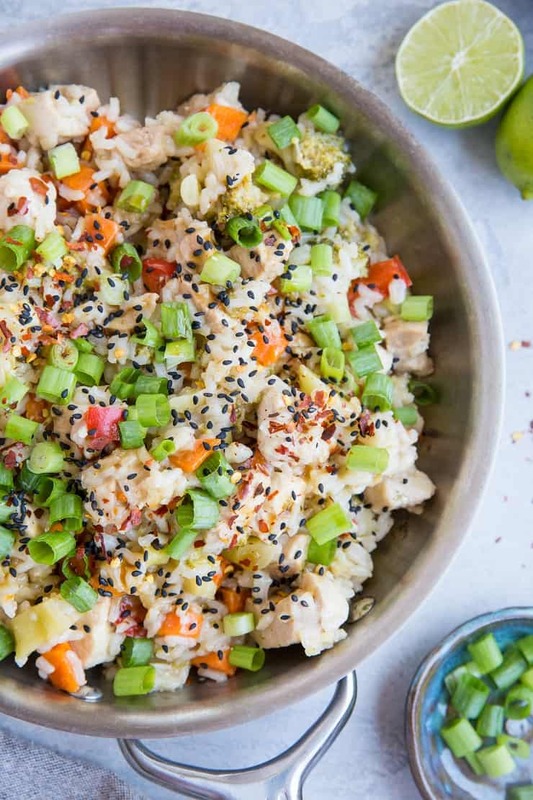 Serve chicken teriyaki with chopped green onion, sesame seeds, and red pepper flakes. **Replace coconut sugar with brown sugar if you're fine with cane sugar. Just made this tonight. Was sooooo good, I used reduced sodium soy sauce and brown sugar. Do you have other instant pot recipes. Would love more please Julia! Hi there! I’m so glad you liked it! This is my first and only Instant Pot recipe so far, but I’ll be posting more Instant Pot recipes in the coming weeks, so you’ll have more to look forward to 🙂 Thanks for the sweet note! I don’t have an Instant Pot cooker, can I use my crock pot or something else to prepare this recipe?